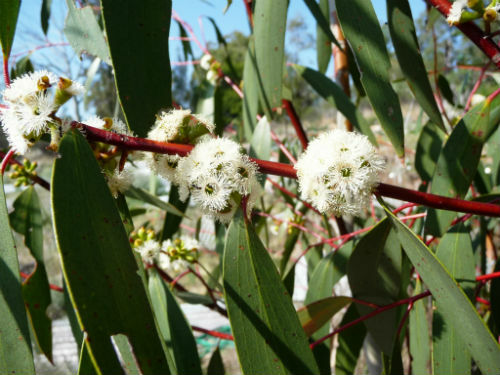 Eucalyptus gregsoniana, Wolgan Snow Gum is a tall shrub or small tree reaching a height of six metres. In the wild plants often develop mallee growth habit with multiple trunks. Cultivated specimens usually confine themselves to a single trunk. The bark is smooth, white or grey and shed in ribbons. Leaves are ten centimetres long, 2.5 centimetres wide, lanceolate, leathery and grey-green on both surfaces. The leave’s minor veins are almost parallel with the prominent mid vein. This is a distinctive feature. On most eucalypts the minor veins are at an acute angle to the mid vein. Flowers are carried in clusters of 7-11. Blooms are one centimetres across, white and appear in spring. Fruits are pear-shaped or globular. Wolgan Snow Gum has scattered populations in NSW. Distribution extends from the Blue Mountains, west of Sydney to the Southern Highlands, NSW. The species is rare but protected in a number of national parks. E. gregsoniana was named in 1973 and honours the Gregson’s, both father and son who were keen amateur botanists who lived in the Blue Mountains, NSW. There is a specimen growing outside in Kew Gardens, UK. 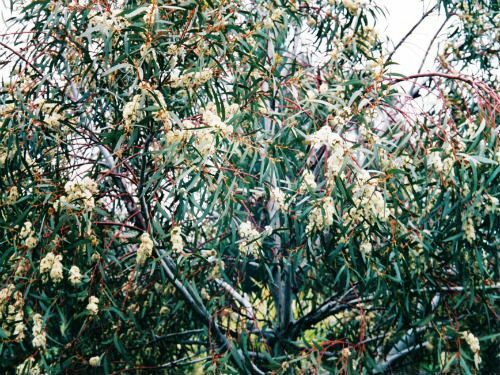 The second photo shows this Wolgan Snow Gum in full flower. E. gregsoniana was previously known as E. pauciflora var. nana.